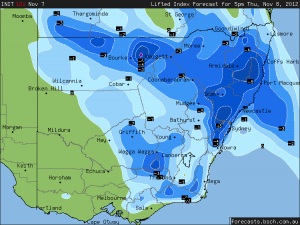 With upper level cooling across NSW occurring during the day, there is sufficient instability for severe storms in eastern NSW although widespread storms may occur in other parts of the state. 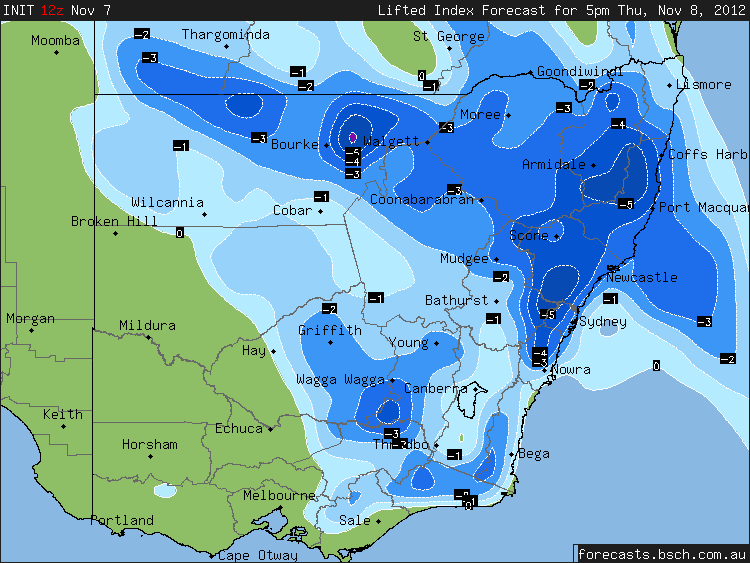 Heavy rainfall will occur on the Mid-North Coast this evening and overnight.The main potential for storms will be the Hunter Valley and perhaps Sydney early on. Good luck for those hungry chasers out there. I will be at school today and then will see what is around after then. Latest satellite image shows a cumulus field. Evidence of storms trying develop although this one I was watching west of Sydney already dissipated. Early days as yet. Harley are you in the Hunter yet? Looking good for storms later on here in Port Stephens. The air has a very stormy feel and smell to it. It’s promising to see the cumulus field developing. Last night we had a decaying storm line pass over with just two rumbles of thunder. Hoping for heaps more this afternoon and evening. What an amazing severe storm this afternoon! Just got back from a chase and sadly I missed the best part around Londonderry as I headed south earlier to the storms around Camden and just couldn't get back up quick enough. Who would've thought there would be such a severe right mover? 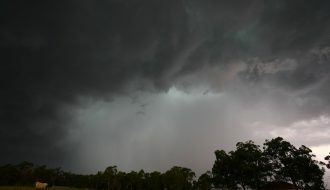 I did manage to intercept it at Kemps Creek and the hail and rain core was extremely intense. There is a lot of damaged trees in St Clair. Nice capture there Jeff. BoM were a little tardy issuing the first warning for this storm. Sorry Matt I never got back to you – I was at school all day and quite busy. Well done Jeff on the supercell and I know that Colin was also onto the storm between his area at Cambridge Park which sustained heavy damage and hail and Werrington. I guess the storm then was in a bow echo structure and then redeveloped along the southern flank. David just called me to suggest it was a confirmed supercell – not surprising given the right mover left mover split. No worries Jimmy. A very disappointing day up here. 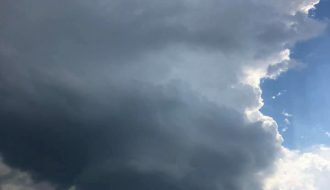 The high cloud kept the convection suppressed and only weak storms were able to develop around Barrington and Gloucester. 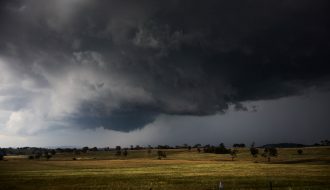 Steady rain here at the moment which is welcome, but no lightning :-( Your shot of the supercell near Badgerys Creek is excellent Jeff :-) Definitely a beautiful looking storm. Another interesting feature today was the south east wind change that came in right before the storm. You can see it run into the range west of Richmond just as the storm was first coming of the mountains. After talking to Jimmy about similar events its quite possible that this was key to the intensity and longevity of the right mover today. I went up to the lower Hunter Valley. Strong cumulus fields and alto cumulus castellatus were evident during the early afternoon and I had expected something significant. However only weak storms developed. One storm developed to the south of Singleton and another to the west. The western storm kept producing fresh cloud towers so I went out to take a close look. That storm weakened but another small storm built up close to me. I saw two cloud to ground lightning strikes close to where I was and I expected it to develop further due to the amount of cumulus cloud immediately to its east. However it collapsed. 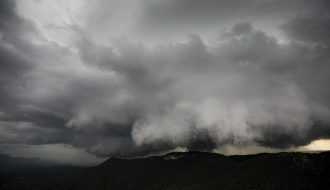 Following that, I saw bigger storms begin building roughly 80 km south, so I worked my way south via Broke then Cessnock. I received a call from Jimmy and explained my location but was aware of a storm down south. I managed to close in on a strong cell at Morrisett. I took a very small number of photos before it weakened off the coast. Folowing dinner, I drove into a storm just south of Morrisett. 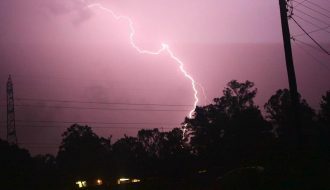 That one was producing some substantial rainfall and ocassional sheet lightning. I should have stayed closer to Sydney because the storm cells look impressive. I have viewed the radar images and seen the photo provided. Well done. Kimberly, do you have any pictures of the damage? Also did you see a tornado? We would love to see some pictures – feel free to post the on here! Colin, Do you have any pictures – please post them especially of the structure! I did not head far out of Sydney but alas nothing substantial came towards the Central Coast. Probably my best photo of that Morriset storm looking south. I am betwen Cessnock and Freemans Waterhole. The cell can be seen with the updraft towers building through the cirrus cloud. I managed to get very close to the storm. I did not see much lightning in it but it did produce a good rain free base as I was driving along the F3 towarsd Morriset. I have no photos of it as I had nowhere to stop. I was talking to Jeff Brislane last night about similar type of events where the right mover dominated. The Mudgee supercell 2006, The Oaks hailstorm 2001, perhaps Newcastle hailstorm 2006, and then I was thinking how about the Horsley Park hailstorm 1996! Not sure if the latter two were splits but definitely right mover structures! Michael Bath May like to post some links of these storms as a reminder and associated radar imagery! There’s no complete radar loop. If I recall correctly, the large supercell on the Central Coast was a split. 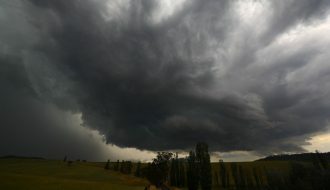 The right mover of that ended up over Sydney earlier (first photo in the first article link) but it was another right mover that became the Horsley Park supercell. Hi kimberly, do you know the streets that were affected by this narrow damage? I live in Penrith so i will go and take a look. Might need to add the 9th to the title! We just had a nice, compact supercell through parts of Sydney. Got some video on the phone so will upload if ok. I was around Hunters Hill / Gladesville and the circulation came right over so will be interesting to see what the doppler scans reveal. 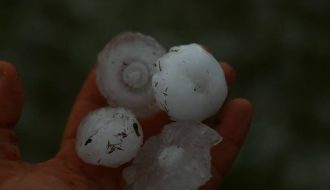 Hail ~ 2cm, strong winds as the meso moved overhead. Cells were low topped, still some decent cgs around. Would the Horsley Park hailstorm 1996 have anything 2 do with a hailstorm that occurred in the west of Sydney in October 1996? 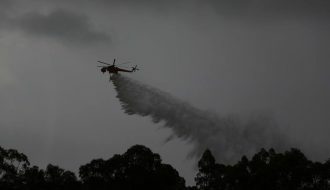 I remember being somewhere in Fairfield during that time sheltering at a petrol station and the hail seemed close 2 golf ball size. Jeff Brislane, do you have any other pictures of this event? I mean anything else to show the structure! Hi Jeff Brislane, thanks for posting the new pictures – you were getting mighty close at that stage! It does look like the back areas of Badgerys Creek.